My wonderful sister-in-law stopped at Dirt Cheap a couple weeks ago and she got me the best deal! Probably one of the best deals this year! She got me 480 for $85! That is $.17 a diaper! For size 6, I might add. 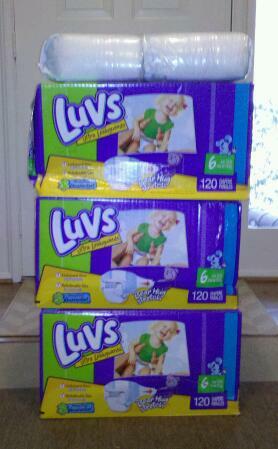 She also got me all of these wipes for $19.80! So, what is Dirt Cheap? I never heard of it myself until she called me to ask if I would like diapers and wipes. It is a true rock bottom price store that gets truck loads of items and there are times you never know what they may have. Per my family, it isn’t recommend to go out of your way just to see this store so it is recommended if you happen to be in the Thurmont, MD area stop by, you never know what you might find! The Store with Unbelievable Prices!! Dirt Cheap is located just north of Frederick across from Beckley’s Camping Center at mile post 23. Dirt Cheap receives regularly weekly shipments of discount merchandise from a variety of sources and will never know what is arriving until it is unpacked and priced…Dirt Cheap! The truth is-there could be Any Product of Any Type in this Store at Any Given Time! Don’t Miss Out on Dirt Cheap Prices! There are always ongoing in-store sales with discounts sometimes as high as 60% off. Thanks for sharing about Dirt Cheap; I’ve never heard of it before, but if I find myself in that part of Maryland for something else, I’ll probably stop by and check it out! Hope you’re ready for this big snowfall this weekend; enjoy the snow! .-= Laura – Frugal Friends in Northern Virginia´s last blog ..Noticed some discounted Seventh Generation Products at Harris Teeter – FREE After Coupon =-. I’ve never heard of this place – thanks for the tip! I’ll think I’ll have to grab my SIL who lives just below Frederick and make her trek up to Thurmont with me! Thanks Holly! You’re welcome! Again, I’m not sure what you will find. Please share what you do find.